Pecos Road is now closed off for good. 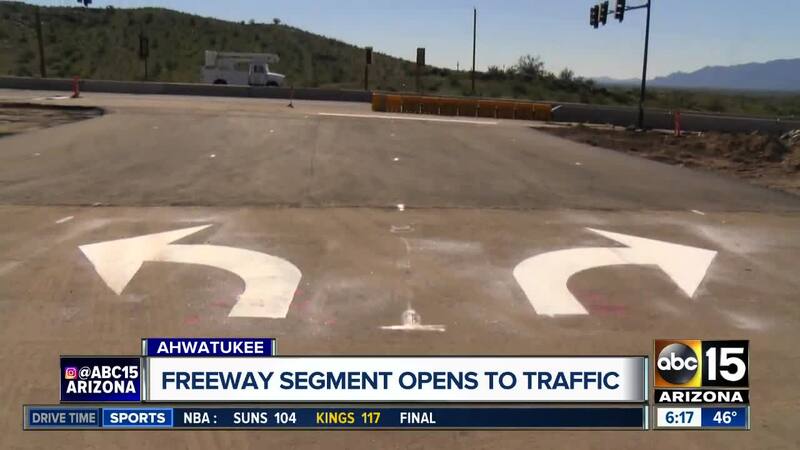 AHWATUKEE, AZ — A portion of the upcoming South Mountain Freeway opened to traffic Monday morning in Ahwatukee. Westbound traffic along Pecos Road will now be shifted onto the future eastbound lanes of the freeway from Desert Foothills Parkway to 17th Avenue. That segment of Pecos is closed permanently and will eventually become part of a 6-mile multi-use path. "This is a huge and necessary step for the South Mountain Freeway project," Dustin Krugel, a ADOT spokesman, told ABC15. "By shifting traffic onto the mainline it's going to get us that much closer to ultimately opening the freeway." A temporary traffic signal was installed west of the old intersection to accommodate traffic turning onto and off Desert Foothills Parkway. Southbound traffic on 17th Avenue will use a future off-ramp to enter the roadway. The speed limit along the freeway portion is 40 miles per hour and 15 miles per hour on ramps. While there is currently one lane running each direction -- both in the future eastbound lanes -- there will eventually be eight lanes on the freeway, four in each direction. Krugel said there will be future closures and detours to accommodate repainting the roadway and adding additional layers of asphalt. Construction crews will continue working alongside traffic and ADOT is urging drivers to be extra cautious when traveling through the area.